40 Days is a response to my friend, Andres question about, Who is your God? This book will respond to that question by teaching as Jesus did, in key themes. 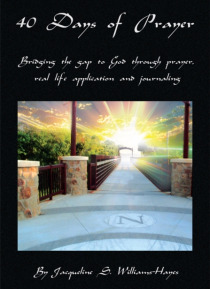 There are four major themes that will lead the readers heart and mind to a meaningful prayer life via The Lords Prayer, understanding the steps to salvation through the Romans Road Route, walking closer to God and calling him friend through f… asting and prayer, and by reading the Biblical prayers of great prophets and kings who modeled how to communicate to God through their prayers and lifestyle. In the words of my first professor, Dr. Gordon Borror, Professor of Worship at Southwestern Baptist Theological Seminary, Life for a believer in Christ is Worship/Service-the glory of God is always the issue and prayer is an essential part of worship, as is time in the Word and our continuing Song!Why 40 days? It takes that long to establish a spiritual discipline. Noah was 600 years old when he had to endure 40 days and nights of rain to bring about a positive change, and then we got the rainbow (GE 7,8,9.1-17). Moses was on Mount Sinai for 40 days and nights, neither eating nor drinking, but writing down the words of God and in return received Gods radiance on his face and the 10 Commandments (EX 34.27-29). Goliath, a giant Philistine, shouted threats of death against the army of Israel for 40 days and nights, then David, a young Israelian shepherd boy, killed him with a stone and a sling-shot. David was promoted to live in the kings palace and fight in his army ( I SA 17.8-58). Jesus was led into the desert by the Holy Spirit for 40 days to be tested and tempted by the devil, neither eating nor drinking, and then he was hungry (LK 4.1-13). Jesus was resurrected and returned for 40 days and spoke about the kingdom of God to his disciples. Jesus ascended to heaven and baptized his disciples and church with the gift of the Holy Spirit (Acts 1.1-5). After 40 days of seeking Gods face you will come to know the joy of being in his presence.